Fennel is clearly in season in Be’er Sheva; it’s in abundance at the supermarkets and the shuq. High in vitamin C, potassium, fiber, and calcium, this anise-flavored vegetable is incredibly versatile. A member of the parsley family the whole fennel can be eaten, from the bulb to the feathery fronds (which are great to season soups and stocks). Thinly sliced fennel adds a crisp component to any salad and goes particularly well with oranges. 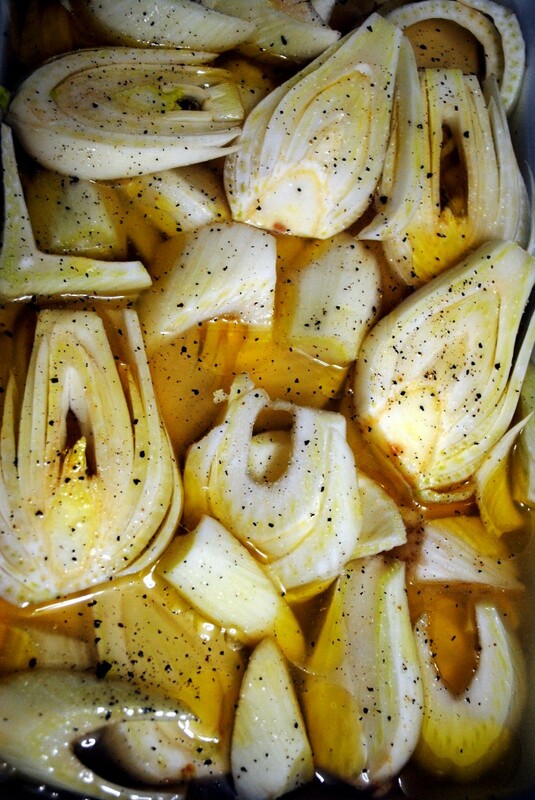 When cooked, fennel softens and the flavor mellows and sweetens. I had two fennel bulbs I needed to use ASAP, and I had exactly two cups of stock leftover. This recipe was a perfect match. It’s another Mark Bittman winner – I’m on a bit of an MBitt kick since downloading his app – and as usual the recipe is simple to prepare with flavorful results. The grated Parmesan on top makes the dish almost a gratin, and it’s an elegant and easy side that would complement almost any main. It takes 45 minutes to bake but only a few minutes to prepare and the entire cooking time is hands off. Bittman offers suggestions for variations including fennel baked in orange juice and fennel with onions and vinegar, which I will try next time. I used homemade chicken stock and breadcrumbs (simply put bread in the food processor) but store bought stock and breadcrumbs will work just as well. Use vegetable stock to make the dish vegetarian and omit the cheese to make it vegan. Heat the oven to 375°F. Put the fennel slices in a gratin or similar ovenproof dish. Pour in enough stock to come to a depth of about ½-inch. Drizzle with the olive oil and sprinkle with salt and pepper. 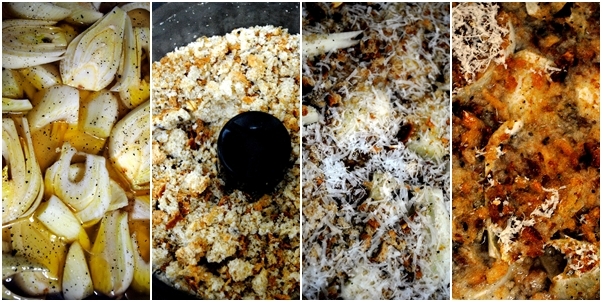 Top with the breadcrumbs and Parmesan. Transfer to the oven and bake until the fennel is tender and the top is nicely browned, 45 to 50 minutes. Serve immediately or keep warm in the oven for up to 30 minutes.